The book that has helped thousands of people around the world create relationships that are intimately connected on all levels: emotional, intellectual, spiritual, and sexual. This groundbreaking guide to intimacy will show you how to create and sustain a connected, compelling, and truly passionate relationship. This special edition of The Soulmate Lover makes a beautiful gift. With the tools and insights you will gain in this 23-day online course, you will completely transform your experience with jealousy. 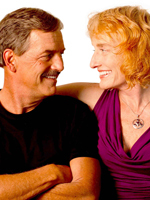 Informative, entertaining conversations about love, intimacy, sexuality, dating, and marriage. Whether you're single or in a relationship, we can help you make radical and lasting changes in the love, intimacy, and connection you are experiencing in your life. Receive occasional inspirational emails, news of upcoming books and events, and free goodies! We donate a portion of the proceeds from all sales to support humanitarian causes.